Watchbands. 11cm lenght. We have no clocks for sale so this kind of works are only made under request. In case you have a clock already it must be sent previously to us. In other caeses we can put a clock by ourselves. Hello! 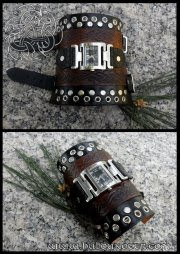 I am interested in the top bracer (less colorful one). 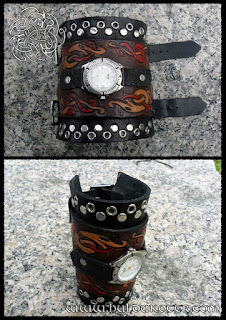 I am buying a larger sized watch (3cm wide by 5cm long) and was wondering if you made customized straps? I believe the pin is 22mm.